Last Saturday was J-L’s birthday. A great and classy lady with cheerful demeanor. The birthday was held at Mezze, Damansara Height (behind Victoria Station). Meze or Mezze also means finger-food / small dishes in the Eastern Mediterranean. Sort of like Tapas of Spain or h’or d’oeuvres of France. 2) Pancetta and Prawn Tempura – interesting. It was serve with garlic + wasabi sauce. 1) Barbecued Spatchcock Chicken – Spring chicken. Well marinated. Juicy and not too overly done. 2) Ballotine of Lamb – Marinated lamb served on cous cous. Love the cous cous. Lamb was ok only. Right after dinner, some of us proceed to have coffee at Mont Kiara coffee-bean. Quick Summary : Max. 6 player. Each player gets about 6 tiles, if combine 2 tiles together, can build hotel. After placing one tiles on the board, you can take another one. You can buy share of the hotel after you place a tile. If you build the hotel, you can get one free share. Each time, you are limited to only 3 shares (from any hotel). 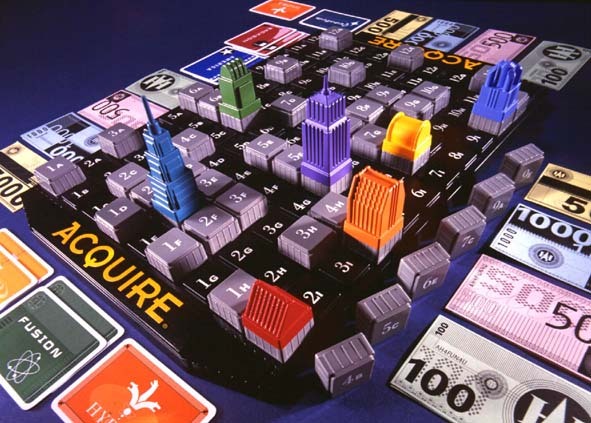 The more tiles surround the hotel, the higher the share value to the share holder. Merger of hotels can also happen. So, it is interesting to trade shares, sell or keep (if the player thinks that there’s still opportunity for that hotel to be re-open again). It’s about balancing cash, shares and knowing which hotel to grow and keeping your triumph tiles.